Meet and Greet in Second Life. Enter the virtual world of Second Life and meet TLF Founders Harold Becker (Avatar HB Eternal) and John Goltz (Avatar JT Christos) at The Love Foundation Office Monday, May 1 at 10 pm eastern for Global Love Day celebration - it may be a virtual world but the love is real. Each year we host a virtual Global Love Day event on May 1st in the extraordinary online world of Second Life. Everyone across the world are able to join in and meet with others celebrating Global Love Day - a global event in a single place! To participate in this special event, it is necessary to go online into Second Life. It's all free and you can do it for the first time on the day itself, although we recommend you go into Second Life at least a few days beforehand to create your avatar. We have a summary and detailed information below to help get you started. Second Life is a 3D, multi-media, fully interactive and surprisingly realistic simulated world where people 'live' through bodies called 'avatars' which they can design to their own liking to be human or animal or more or less anything you can imagine! 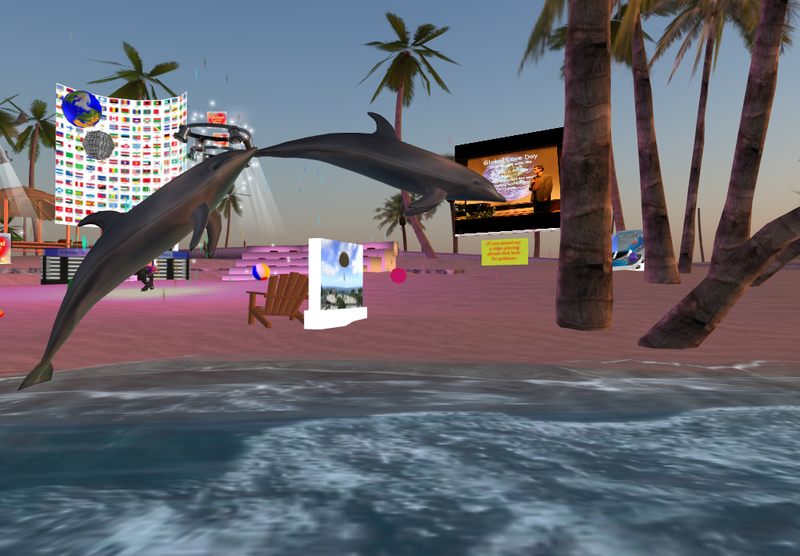 The photos on this page show our site as it was in 2010, 2011, and 2012 with dancing avatars, all of whom were actually real people interacting 'virtually' with friends or people they'd met there at the beach and dancing area where we were hosting our Global Love Day event! 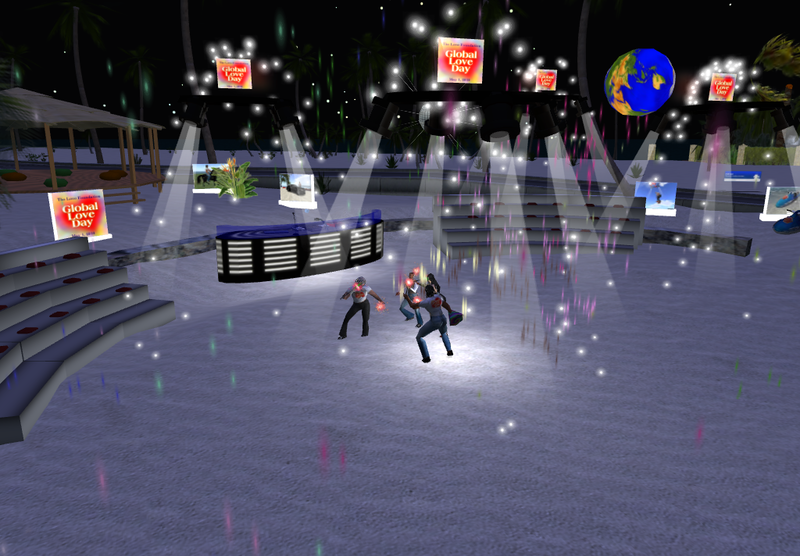 2010 was our first experience of Global Love Day in Second Life. One of our supporters, whose Second Life avatar's name is Philip McGillivary, together with one of his online friends, created a wonderful tropical beach where there was dancing to the ever-popular 70s music, sailing and jet-skiing, fireworks extravaganza, fully interactive web-based media including recorded broadcasts by our TLF founder Harold W. Becker and of course... love was all around! Each year since, we have enjoyed great success, enabling lots of people from around the world to participate virtually in a Global Love Day event. Second Life really does give the feeling of 'being there' and being part of a group enjoying an event or other activity. So we're doing it again on May 1st and we hope that anyone who wants to join an event but doesn't have one nearby in real life will join the fun in Second Life! 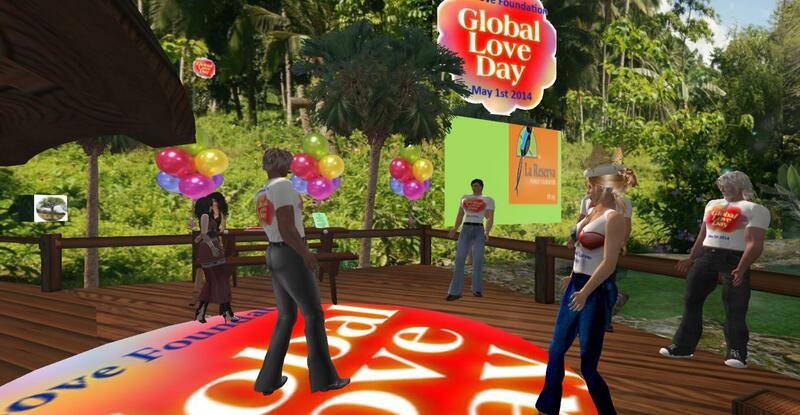 To participate in this Global Love Day event on May 1st, it is necessary to go online into Second Life. It's all free and you can do it for the first time on the day itself; although we recommend you to go into Second Life at least a few days beforehand to acclimatize yourself to the environment. Unless you are used to interactive online games, the initial process may seem more than a bit perplexing! 10. 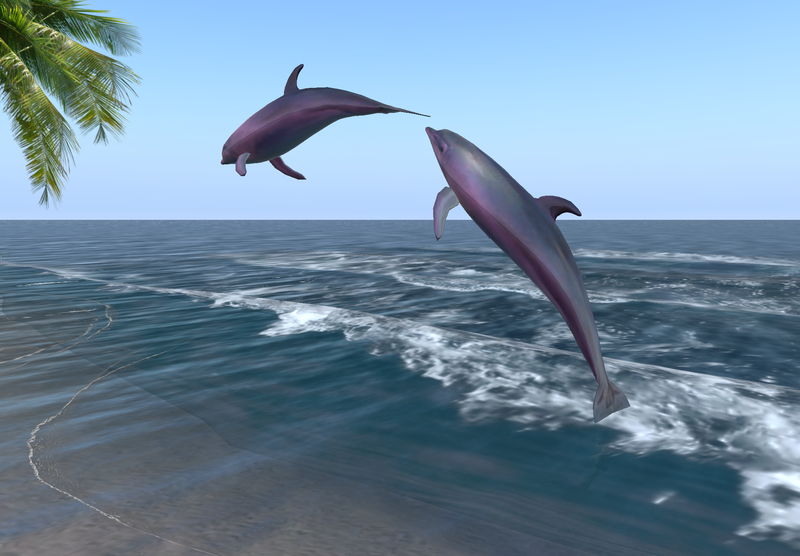 Download the Second Life viewer software. To run Second Life you will need an up-to-date computer or an older one with a fairly high specification. Also you will need broadband download speeds of at least 2Mb/sec at peak periods. Without these, you may find the performance of Second Life disappointing or even unavailable. 11. Follow the download process as illustrated, and click in 'Start Second Life when install finishes'. 12. Enter your online name and password, and log in. 13. You will find yourself arriving at the reception place you can choose from a list, probably at the same time as other new members ('newbies') arrive. 14. Wait for your surroundings to 'rez', that is, when your surroundings and objects and avatars come clearly into view. 15. Take it easy if things seem very unfamiliar. No-one's going to make you feel uncomfortable, and generally everyone is very helpful in Second Life though if you're talking to other 'newbies' they may not be able to help. Usually there are experienced helpers on hand there, so simply ask whatever you want to know. 16. Do a 'search' under the 'People' tab for Philip McGillivary. Click on his name to open his profile where he has written an introduction for you, together with a 'landmark' for where the Global Love Day event is being held. Click on 'Add Friend' and when he receives your request to be a friend he will contact you and introduce himself to you and give you whatever help you want or need. 17. And from that point on, enjoy yourself! We're sure you'll have a great time! Important Special Note: As with any online activity or social network, discretion and prudent practices are essential. Never give out any of your personal information, credit card or any other identifiable information unless you clearly know who you are interacting with. Likewise, only "friend" people you know and recognize. This particular Global Love Day event was created by volunteers, it is completely free to participate (no Linden dollars necessary) and nowhere do they ask for additional information beyond your initial signup with Second Life. Please contact Philip McGillivary on Second Life if you have any questions. Note about Native Language: If English is not your language of choice to use in Second Life, you can choose to have everything displayed in one of the other major languages when you are first joining, and/or you can obtain a free translator device. You can ask Avatars Philip McGillivary or anyone at our site to help you obtain one or you can use this link to go to where the translator can be obtained at the following link: http://slurl.com/secondlife/Grignano/100/97/27 (you can copy the link and paste it in the SL browser window). Left-click on the box you'll see, and then click on 'FREE Copy' you'll see on the blue menu that appears, and the translator will be placed into your Inventory (the tab for Inventory is at the right of your screen). Wait until you find someone who can help you to install and use it, such as the Avatars above. 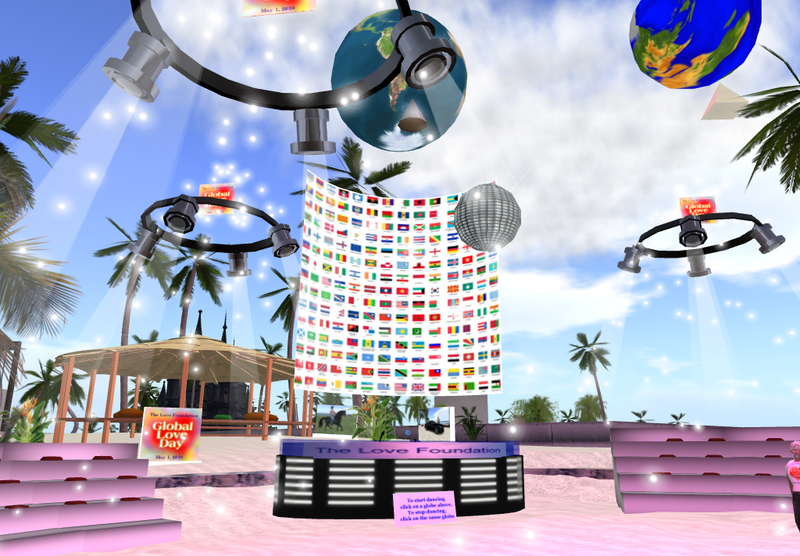 Even if English is your language of choice, the translator may come in handy if you meet someone who does not speak English, as could easily happen at our Global Love Day event and elsewhere in Second Life! So 'Wear' the translator at all times, and what you type into your chat bar will automatically be translated into the language spoken by the person you're talking to, if their chosen language is different from yours.